PerkinElmer and Helix today launched GenePrism: Actionable Insights, a new genetic screening test offering clinical-grade DNA sequencing and interpretation designed to help users manage their own health by learning about their underlying disease risks. 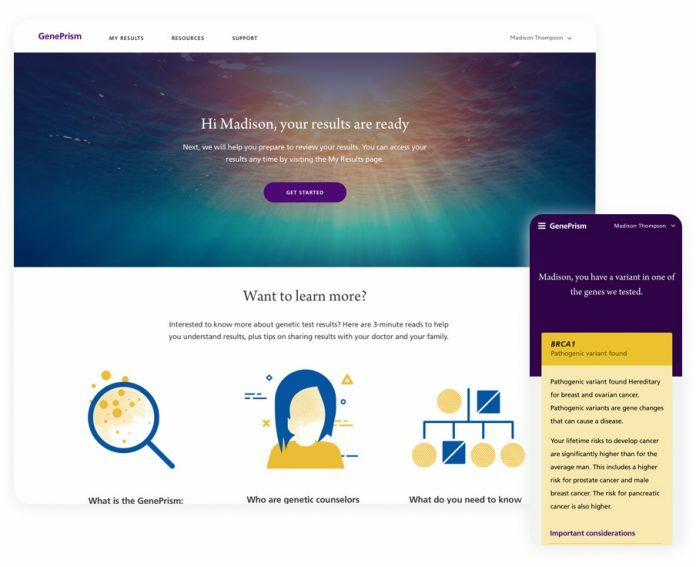 The companies said GenePrism: Actionable Insights was the first clinical-grade DNA test available to healthy individuals that analyzes all 59 medically actionable genes identified by the American College of Medical Genetics and Genomics (ACMG)—a subset of the approximately 6,000 genes associated with disease. Each of the 59 genes is analyzed in its entirety, including BRCA1 and BRCA2, the companies said—contrasting that with many current commercially-available tests that only look at a limited number of letters in a gene sequence. Users of the test have their DNA sequenced by Helix. The results are interpreted by board-certified medical geneticists at PerkinElmer Genomics using ODIN (Ordered Data Interpretation Network), PerkinElmer’s proprietary high-throughput software platform. PerkinElmer Genomics also maintains what it says is one of the largest databases of known genetic variations from different ancestries around the world, allowing for more in-depth assessment of disease risk through GenePrism: Actionable Insights. “GenePrism: Actionable Insights is inherently different from other tests on the market because it leverages PerkinElmer’s longstanding diagnostics expertise and state-of-the-art clinical genomics program,” Madhuri Hegde, PhD, FACMG, vice president and chief scientific officer, PerkinElmer Genomics, said in a statement. GenePrism: Actionable Insights test is available immediately for purchase on the Helix DNA marketplace, at prices that start at $259.99 for current Helix customers and $299.99 for others. That price includes $30 that Helix says is collected to enable an independent physician to review and determine whether the test for a user, as well as for genetic counseling services. Purchasers of GenePrism: Actionable Insights from Helix are required to complete a medical questionnaire and receive physician authorization before submitting a DNA sample. Customers can complete the questionnaire at home, with collaboration partner Genome Medical agreeing to users’ personal and family medical history through its physicians, geneticists and genetic counselors. GenePrism: Actionable Insights testing report also includes free genetic counseling sessions from Genome Medical, to ensure customers understand their results fully and in the correct context, PerkinElmer and Helix said. “Typically, clinical genetic testing that detects ACMG 59 genes is restricted to people with a current illness or specific indicators in their family histories. On a population basis, 3% to 4% of people have a genetic variant that can significantly impact their health, but until now, virtually no one was able to access this critical information even if they request it from their doctor directly,” observed Justin Kao, co-founder and senior vice president, Business Development & Partnerships, Helix. PerkinElmer Genomics said it will be promoting the test at Booth #901 at the 2019 ACMG Annual Meeting, which is being held through Saturday at Washington State Convention Center in Seattle.